Hossein Montazerian, research assistant with UBC Okanagan’s School of Engineering, demonstrates the artificial bone design that can be made with a 3D printer. A UBC Okanagan researcher has discovered a new artificial bone design that can be customized and made with a 3D printer for stronger, safer and more effective bone replacements. 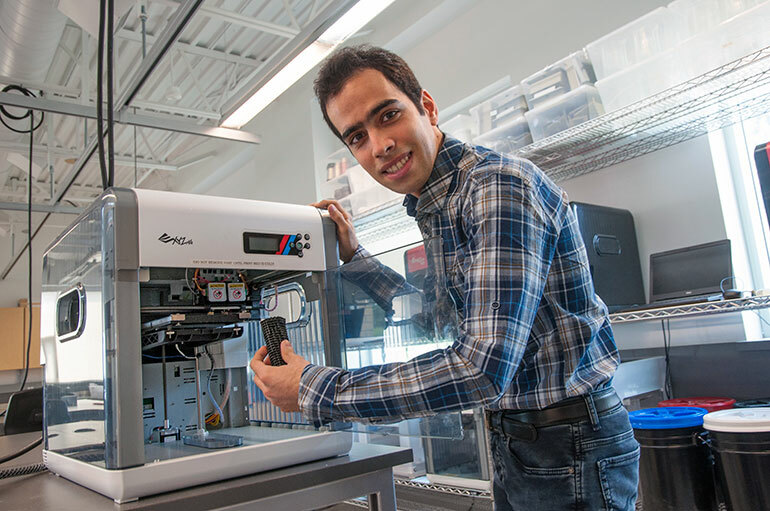 Hossein Montazerian, research assistant with UBC Okanagan’s School of Engineering, has identified a way to model and create artificial bone grafts that can be custom printed. Montazerian says human bones are incredibly resilient, but when things go wrong, replacing them can be a painful process, requiring multiple surgeries. Traditional bone grafting is used in medicine to treat anything from traumatic fractures to defects, and requires moving bone from one part of the body to another. But Montazerian says his artificial bone grafts could be custom printed to potentially fit any patient and wouldn’t require transplanting existing bone fragments. In his research, Montazerian analyzed 240 different bone graft designs and focused on just the ones that were both porous and strong. He printed those that performed the best using a 3D printer and then ran physical tests to determine how effective they would be under load in the real world. Montazerian and his collaborators are already working on the next generation of designs that will use a mix of two or more structures. While his bone graft designs are well on their way, Montazerian says the technology still needs some advances before it can be used clinically. For example, he says other researchers in the field are starting to refine biomaterials that won’t be rejected by the body and that can be printed with the very fine 3D details that his designs require. Montazerian’s research was recently published in Science Direct's Materials & Design.